When using WordPress “out of the box” as a CMS for your website, organizing your pages and site navigation can be a bit unwieldy. Fortunately, their is a simple way to accomplish this using a few WordPress plugins, pageMash and Multi-level Navigation. For purposes of this article, we’ll assume you’ve already installed the pageMash plugin, have properly configured the Multi-level Navigation plugin and have it integrated into your website’s template (ITegrity built websites already have this setup and configured). pageMash works in conjunction with your website’s multi-level dropdown site navigation menu. By changing the settings in pageMash, you can manipulate the order of your page links in your navigation, the placment of your links, beit in the main navigaition or in a dropdown menu under a main link, or whether or not the page link will even appear at all in your navigation. Let’s take a look at how this works. After you’ve logged into the admin area of your WordPress website, click on the menu expansion arrow next to the “Page” link in the left side navigation. Next click on the pageMash link in the Pages menu. After you’ve completed these steps, the pageMash admin page will open and show a graphical representation of the pages you’ve already added to your website. Keep in mind pageMash will show all your pages, even ones that are still unpublished drafts and even though these pages will not appear in your websites navigation until they are published. This feature allows you to prearrange pages before they are published for public consumption. In the example below, the page “RSS” is still a draft, however we placed it in the dropdown menu below “News” because once we are ready to publish it, that’s where we want it to appear. Main page links in your website’s navigation are referred to as “parents” or “top-level” links. The page links that appear below the parent links are referred to as “child” links. 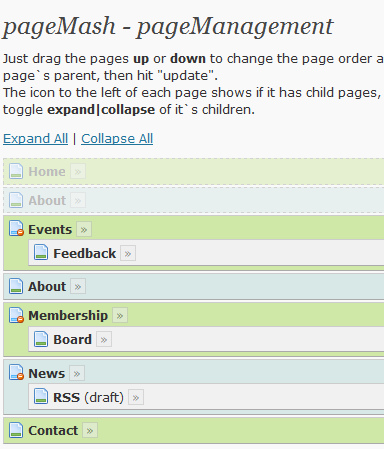 In the example above the page “Board” is a child of it’s parent “Membership”. This means Board will appear in the dropdown menu below Membership when a visitor to your site mouses over Membership. To change the order of your pages links in your website’s navigation, simply drag the page you want to the desired location. If you want to make a certain page link a child of another one of your pages, drag it over the desired parent page link without releasing your mouse button and then continue to drag it just to right of the parent page link. By dragging the page link to the right of the parent link, you’ll see it appear under the parent link slightly indented. This shows you it will be in the child position once you release your mouse button. Membership "parent" | Board "child"
pageMash also has a few more important functions, the first of which is the ability to hide pages from your navigation. You may for example, create a page for your website that you don’t want to be visible in your site’s navigation, as neither a main parent link or as a child in the dropdown. This could be a page that is linked to from within another one of your pages, like a information request form or application page for a product or service. To hide a page from you navigation, mouse over the small arrow icon next to the page link. This will a produce a pop-up menu with three options:  [hide] [Rename]. Move your mouse over [hide] and click. Unfortunately you’ll have to move your mouse very precisely from the page link across the pop-up menu to [hide]. If you mouse off the pop-up menu even slightly, it will disappear. Once you’ve clicked on [hide], the page link will become grayed out. This means the page link is now hidden in your websites navigation. It’s good practice to view your website to test to make sure the page is indeed hidden. The  link has the same functionality as the “Edit” link in the Page menu; it’s a shortcut that opens the text editor allowing you to edit the page. Clicking on [Rename] will provide you the option to change the page’s name directly in pageMash without having to go through the extra clicks of accomplishing the same task in the Page menu of the admin. *For ITegrity WordPress websites: Did you notice your Home page link in pageMash is hidden, but still appears in your website navigation? This is an anomaly and an exception to pageMash because you are using a custom built ITegrity WordPress template that has extra functionality included. The Multi-level Navigation plugin that powers your website’s navigation has been modified by ITegrity to accomodate the small seperator line images between your page links. Although this may seem like a simple detail, it isn’t included in the base functionality of the Multi-level Navigation. Your Home page link must stay hidden in pageMash otherwise you’ll have duplicate Home page links appear in your websites navigation. Very helpful article – thanks! I was able to reorder some pages and it even changed in the banner heading area. I did create a new page – Government – that I assumed would appear in the Banner Heading and I haven’t yet seen it…is this because it is still in draft form or is there something special I need to do to make it visible? Thanks for the nice comment Nancy. You are correct; only published pages or posts will be visible in the website navigation. If it’s still a draft, it won’t appear.